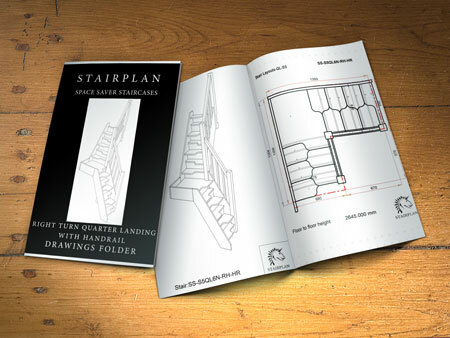 What is a Space Saver Staircase? A Space Saver Staircase is a Compact Staircase that has alternating treads allowing you to get up a flight of stairs in approximately half the going distance of a normal flight of stairs. Very popular for Loft conversions where space is of a premium. 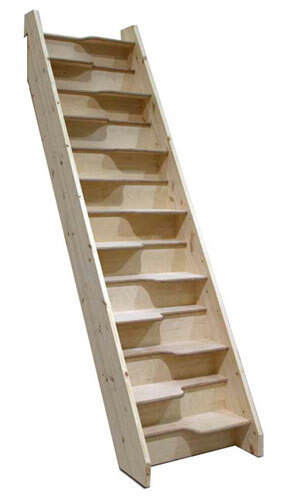 Visit our showroom to see our range of Space Saving Staircases. Space Saver Model Range and Costs? 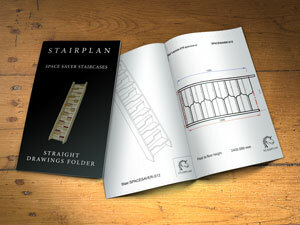 Stairplan are the UK's leading manufacturer for space saving staircases we offer six standard specification models. Space Saver Loft Staircases - Stairplan produce a wide selection of loft staircases please find below a breakdown of the pricing options we have for our standard models. The Budget Space Saver - 32mm Engineered Pine Strings, 30mm MDF Treads and 12mm MDF risers. The Birch 24 Space Saver - 32mm Engineered Pine Strings, 24mm Birch Plywood Treads and 9mm Birch plywood risers. The Beech 40 Space Saver - 40mm Beech Strings, 40mm Beech Treads and 9mm Beech faced risers . The Oak 40 Space Saver - 40mm American White Oak Strings, 40mm American White Oak Treads and 9mm Oak faced Plywood risers . Additional Risers can be added at additional cost. Carpet inserts are available for the Birch 24 and Beech 40 and Oak 40 models at £120.00 + VAT for a straight space saving staircase. This incudes machining the recess in to the Tread and a Carpet insert from our standard colour range. 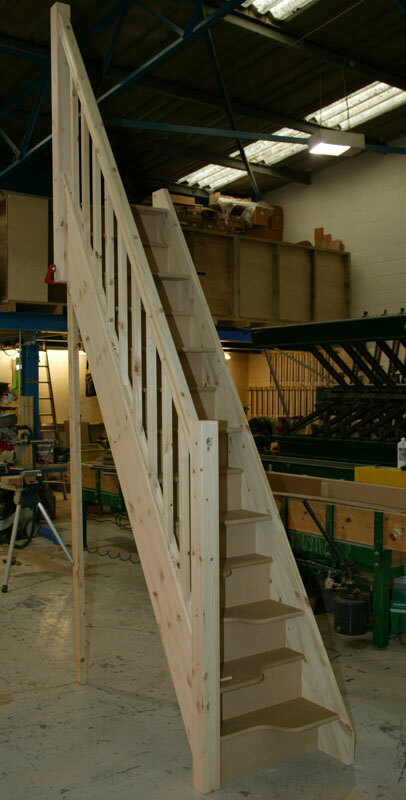 Note - The Budget, Birch 24, Oak 40 and Beech 40 Spacesaver staircase options above are constructed using traditional staircase methods with the treads and the risers housed into the strings and producing a quality robust staircase. You can work out the total length by multiplying the number of risers your flight requires by 110mm (this gives you the 220mm Minimum Going size required by Building Regulations)and adding 20mm for the nosing overlap plus the thickness of a riser (Typically 9.6mm plywood). Our standard width is 650mm. 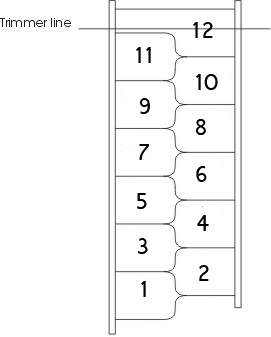 If you require a different width we can make them to your required width. We manufacture up to 800mm in width. All our Space savers are purpose made and are usualy manufactured in 2 weeks. Note - Our Space Saver staircases are manufactured to suit your Floor to Floor measurement, this is required to give you equal riser heights up the total staircase in order to comply with Building Regulations. Our Space saver staircases also comply with the 100mm sphere rules set out in the building regulations. 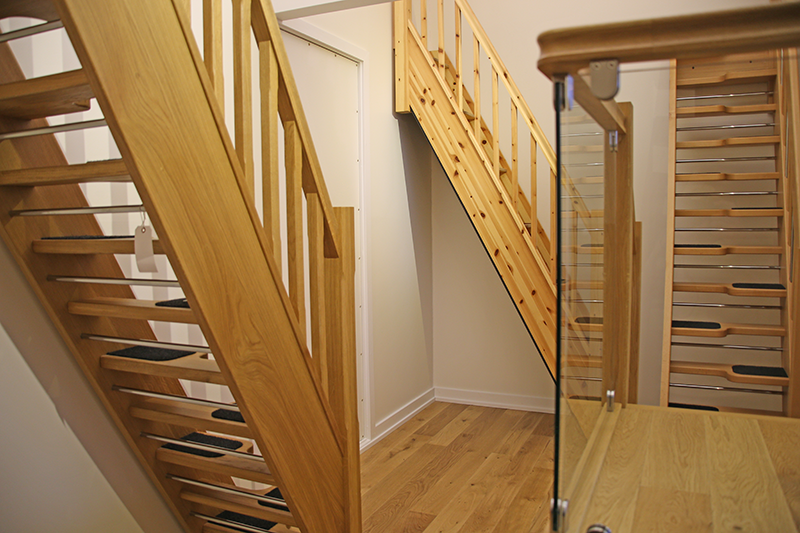 Check that any other staircases you are considering comply with building regulations. Specification:- Strings - 32mm Engineered Pine, Treads 24mm Birch Plywood, Risers 9mm Birch Plywood. This is a quality staircase. Note - The Birch 24 replaces our previous model which used to have Pine Treads, and following our previous experience with Alternating Treads fabricated from Pine we must recommend that you avoid this as the tread material. 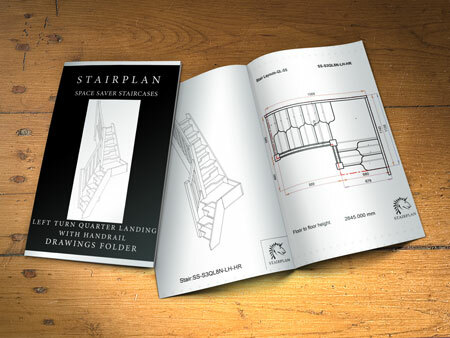 Upgrade Kits were sent complete with instruction DVD's to all Pine Space saver staircases produced by Stairplan - we ceased offering our Pine spacesavers in 2003. 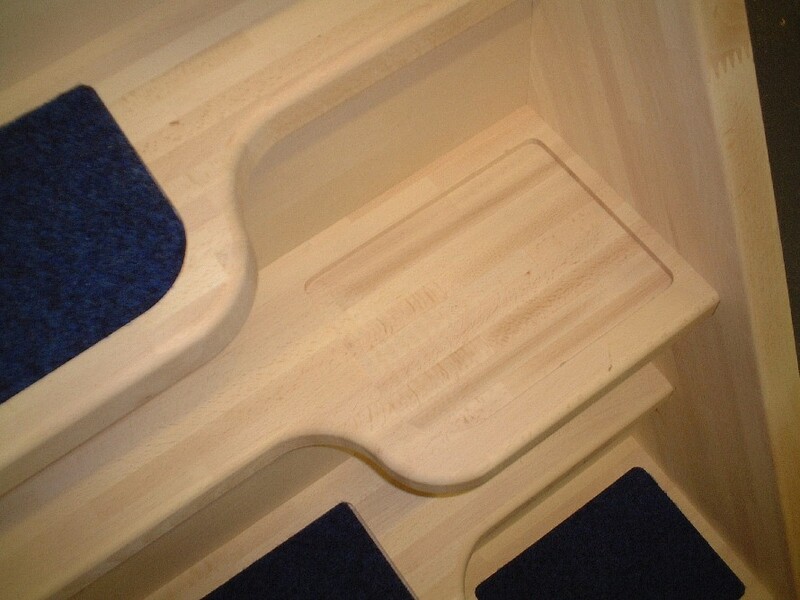 The Budget spacesaver staircase is manufactured to the highest standards with the full paddle of the tread and the risers being recessed into the strings. We offer full flexibility on the Budget Spacesaver staircase - any width upto 800mm and you can order the staircase with any number of risers upto 16. Due to the growing demand for the Oak spacesaver as a bespoke spacesaver staircase we now offer this as a standard specification. Carpet inserts are an optional extra. Shown on the right is the Pine Balustrade option available on the Budget and Birch 24 Space saver staircases. Simple 90mm Square Newel posts top and bottom, 32mm pine square balusters and our standard STHR pine handrail and baserail sections. Let us know if you want a handrail on the staircase. 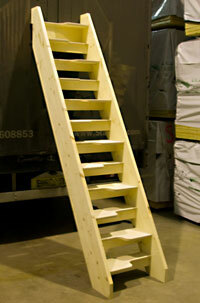 We will give you the option to have the staircase flatpack or assembled. Karina is particularly suited for narrow spaces. Its supporting structure is made of steel interlocking elements and is available in three different colours: black (RAL 9017), white (RAL 9010), or grey (RAL 9006). The accessories are black. The polished beech wood treads with a light (natural) or dark dye are of a special shape to guarantee maximum utilisation of space without compromising the stair functionality. The staircase is supplied with one side railing. Note the Karina Space saver stair kit is a European import and does not meet the UK building regulations for alternating tread staircases. These space saver staircases conform to current UK building regulations for alternating tread staircases. On our standard space saver range we set out our staircases with the 220mm minimum going size set by Building regulations, the rise height is then adjusted to suit your floor level keeping the riser height within the riser heights set out in Building Regulations Document K if you can get away with less risers eg:- 12 risers the going would be 1350mm. We recommend a typical well opening of 1500mm long by at least the width of the staircase depending on your handrail detail. This length of 1500mm is best set once the staircase is in place to whatever you fell is comfortable when walking forward down the staircase, the typical 2000mm headroom above the pitch line isnt any good on a space saver staircase due to the angle you approach the bulkhead. Be aware of claims for products requiring a smaller well opening this maybe for an item classed as a "Fixed Ladder". Stairplan Contact Details | Stairplan Workshop | Visit the Showroom. Who's making your Loft Staircase ?